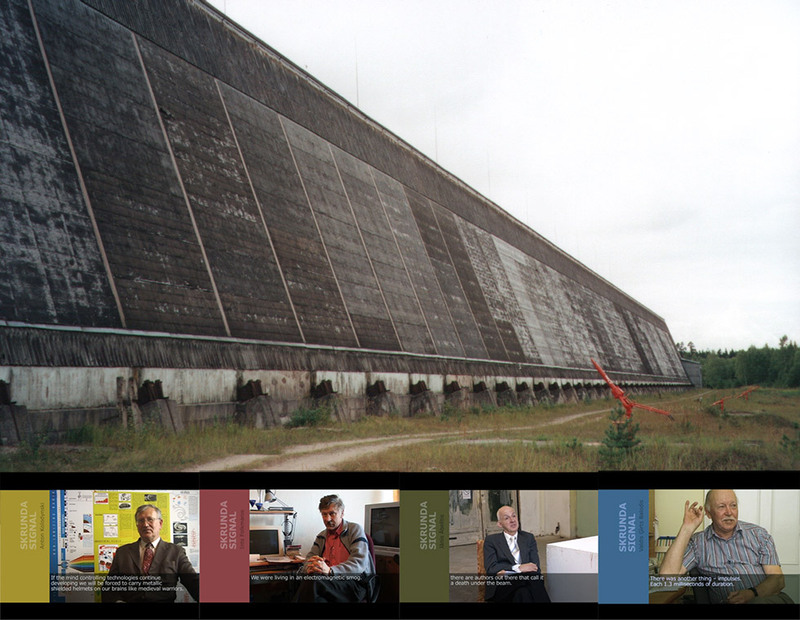 Skrunda Signal is an artistic research project delving into the mythical past of a Soviet early-warning Radio Location Station (RLS) operating from 1967 to 1998 near Skrunda, Latvia. Internationally known as ‘henhouse’ radars, these powerful transmitters – emitting impulse type signals, similar to those detected in the West as ‘woodpecker’ – were allegedly responsible in the nineteen-seventies for shutting down radio transmissions on at least two occasions for up to seven minutes. A metaphysical investigation into spectral ecology, Cold War politics and electromagnetic conspiracies. Skrunda Signal video includes an introduction to the case as well as interviews with four important Skrunda RLS researchers: Ints Folkmanis, public observer at that time, Dr. Valdis Ģirts Balodis (University of Latvia), conducted a broad study about effects on nature surrounding the Skrunda RLS, Jānis Ābelītis – physician, cardiologist, beginning in 1988 conducted medical research on negative effects of electromagnetic radiation on people living in region of Skrunda RLS, Dr. Antons Kolodinskis (University of Latvia), conducted research relating biological and health effects of electromagnetic fields on humans. Credits: RIXC – production; Rasa Smite and Raitis Smits – idea, research, artistic conceptual framework, project execution; Martins Ratniks – video; Linda Vebere – text editing.